These three handsome volumes with matching slip cases, luxuriously leather-bound with gold tooling and gilded fore-edges, hand-sewn silk endbands and ribbon book markers are exquisite examples of extra-illustrated books. An extra-illustrated book is created by inserting supporting documents (prints, manuscript materials and ephemera) into the pages of an ordinary book. The practice of “illustrating” one's own books was popularized after the publication of James Granger’s Biographical history of England in 1769, which included no actual imagery, but provided a “Plan of the Catalogue” for readers to collect portraits of the biography sketches. Throughout the 19th century, “gentlemen scholars” were excited to show off their ability to collect printed and manuscript materials. In 1881, the term grangerize (in honor of previously mentioned, Mr. Granger) was entered into the Oxford English Dictionary. In 1882, the History of the Bank of North America, prepared at the request of Presidents and Directors, was published by the Philadelphia-based J.B. Lippincott & Company. As the title page announces, “This copy is extra illustrated, in three volumes, for the bank, and is to be retained and preserved amongst its archives. It contains many valuable documents belonging to the bank.” There is a preface which explains that this special edition book was created in honor of the Centennial Anniversary of the bank in 1887. The first and second volumes contain many printed portraits of the earliest subscribers to the Bank, followed by lists and portraits of the later subscribers. (Earlier in the project, I wrote about the printing plates for some of these portraits .) The only woman included is Anne (Willing) Bingham, daughter of Thomas Willing, the first president of the Bank of North America. Noted socialite, Anne was also a model in many paintings for the artist Gilbert Stuart, and it is suspected that her likeness was used for the image of Lady Liberty on the "draped bust" coins. Some of the original documents contained are receipts for items used by the actual bank including furniture, ink, and paper used to print currency. Gallons and gallons of ink purchased. Receipt and sample of paper from Mark Willcox of Ivy Mills. The books contain a variety of printed currency - shillings from the 1790s to paper money of branch banks from the 1880s. A trustworthy friend guarding the key to your protected funds. The third volume in the series stands out, as it contains folded documents inset into thicker pages. The thick pages are created by layering framed paper in the shape of the document. The inset pages contain the charter of the Bank of North America and then subsequent documents renewing or amending the charter. 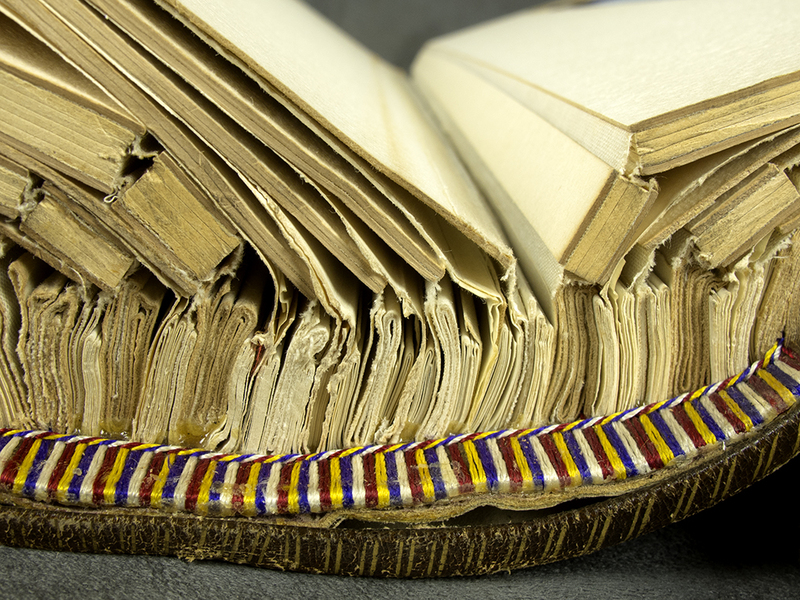 Thickened pages created to hold folded documents. Extra-illustrated books provide an engaging reading experience in which the text narrates an exhibition of prints and documents. More images of the Bank of North America extra-illustrated volumes can be found on HSP’s Flickr page . History of Chestnut Street, Philadelphia  (scrapbook and sketches) by Casper Souder Jr.